Life is all about finding activities & adventures that are a little bit different. It doesn’t need to be extreme or laborious but rather an experience which gives you a new perspective to the world. 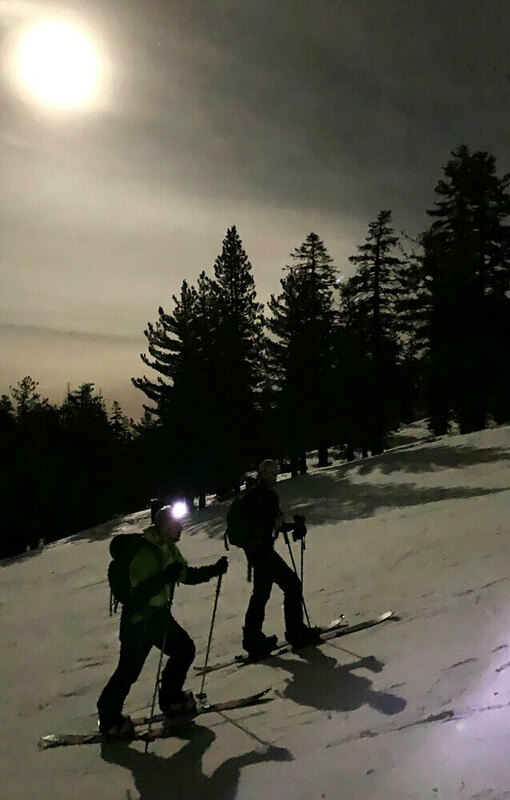 So, when we received the invite to go skiing under moonlight, we had to say “Hell yes!” On top of that, I had a few friends in town that had never gone backcountry skiing. Since we’d be on groomed trails within a resort, this was the perfect opportunity for them to try earning their turns without worrying about all the other things that come to mind when in the actual backcountry. 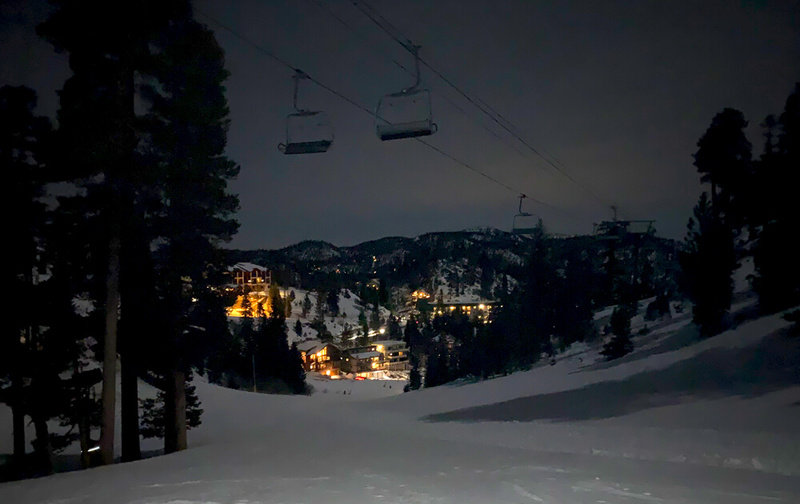 The opportunity to go skiing under moonlight is rare. Similar to backcountry skiing a certain steep line, everything needs to align. How come? Well first, the moon isn’t visible every night. Second, to have enough light to ski via moonlight you need a clear sky. For January’s full moon, we were in luck! The weather from the last storm had cleared & it seemed like the wind should die down enough for us to enjoy it. With the trigger pulled, we met up at the resort’s parking lot around 4:45 p.m. Slamming down the tailgate, we snapped open a beer and absorbed the moment. Normally when we’re here, we’d be enveloped by hundreds of thirsty powder hounds vying for first chair. Instead, we leisurely sipped a brew. It was refreshing to be surrounded by only our friends as the laughter echoed across the valley. As the sun’s last flicker of light disappeared, it was replaced by the eerie brightness of the full wolf moon. Named by Native Americans, it’s the time when wolves howled in hunger outside the villages. With some guidance from the crew, my two good friends got their rented splitboards ready for the climb. Skins on & poles out, it was time for the adventure to begin. Step-by-step we began our ascent. Across the ski trail to the ski-in / ski-out condos, we could hear the clinking of beer bottles and jubilant folks enjoying themselves. And in front of us, the slope was bathed in a colorful display reminiscent of a laser show from someone’s Christmas light projector. Making our first turn, the sounds & lights disappeared and we were greeted by nature’s bounty. The only sounds were from the crispy crunch of snow under our skins and the visual star tapestry above us. We continued our uphill trek, just trying to take in the entire experience. Looking up to the shining motion-less chairlift, we began to appreciate the work it does for us. Weaving our way up the cat track, the only life on the trail we see are hospitality employees & snowcats bringing down the garbage & debris from the day’s skiers & snowboarders. They give us a honk & yell from their cab, “You guys are savages! You’re almost there.” Looking over to my two buddies, a grin comes over their faces. Re-energized, their steps become more deliberate and powerful. The last fifty feet of the climb was the hardest. On a true skin track, we climb to the very top and unstrap. Stepping over to the ridge, we took in the 360 degree views around us. On one side, the glistening lights of South Lake Tahoe thousands of feet below bounce off the white snow on Mount Tallac and the Crystal Range. While on the other side, the flat orange glow of Carson City and Reno greets us with its warm ambiance. Das Bier Der Berge Time! Sitting there chomping down on a funky assortment of snacks like dried mango, Oreos, sausage & cheese, we take in what we have accomplished. Our group of varied experience levels had made it! Popping open a “Das Bier der Berge” beer, we all raise our drinks to a job well done. It was now time for dessert. It was time to ski down the mountain. Slapping our splitboards together and throwing the poles & skins into our backpacks, we strap into our boards. Brian and Jenay take point and drop in. Even in the darkness, you can tell their form is perfect. Linas & Mikey are up next followed by Courtney & Zion. Giving ourselves enough space, we weave around each other and ride down to the bottom. Looking up the mountain both Linas & Mikey exclaim, “Wow! That was one of the coolest things we’ve ever done. Thank you!” I have to agree with them. A HUGE thank you goes out to Brian, Jenay, Courtney & Zion for extending the invite. It was an adventure unlike any other I’d ever done before. You all are savages!